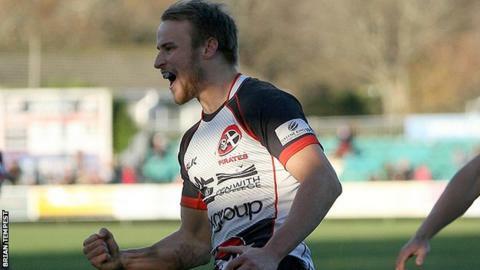 Cornish Pirates boss Ian Davies says he was "shocked" by his side's 65-14 Championship win over Bedford. The Pirates scored nine tries to move up from second-from-bottom to eighth in the Championship. "I'm shocked more than anything," Davies told BBC Radio Cornwall. "We trained awfully this week; I think we put more balls down in training than I've ever seen before. But fair play to them, they really turned it on today and that's all that matters." First-half tries for Max Bodilly, Tom Kessell, Kieran Goss and Alex Dancer were added to in the second by scores for Goss, Craig Holland, Rheon James, Stuart Townsend and Laurence May. "I'd have been pleased with a win today, let alone a 60-pointer against a Bedford side that are always a challenge." Fly-half Kieran Hallett kicked seven conversions and two penalties as the Pirates recorded their biggest win of the season. "Tom Kessell really with an outstanding performance and Kieran Hallett the same, I thought both half-backs were outstanding," Davies added. The victory also pushed the Pirates further away from the relegation zone with three teams now separating them from bottom side Plymouth Albion, who drew 17-17 at Yorkshire Carnegie to get their first positive result of the campaign. "With Plymouth getting a good result on Friday we needed to win this game to put a bit of a gap between ourselves and the bottom of the table and we've done that," Davies said. "It's unfortunate that we've got British and Irish Cup matches before our next league game which is the derby match against Plymouth."